Black Multi Wire Baskets, 12" x 12" x 4"
Black Multi Wire Baskets, 24" x 12" x 4"
Dimensions: 24" x 12" x 4"
Chrome Multi Wire Baskets, 12" x 12" x 4"
Chrome Multi Wire Baskets, 24" x 12" x 4"
White Multi Wire Baskets, 24" x 12" x 4"
White Multi Wire Baskets, 12" x 12" x 4"
Slatwall wire baskets look like a shopping basket without the handle and attaches to Slatwalls Panels. Two rods are stuck from the bottom to the back of the basket and at the ends of both rods, there is two prongs which are used to stick in-between the slatwall inserts. 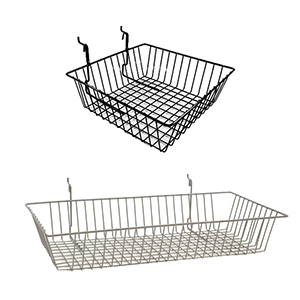 American Retail Supply has two different sizes to pick for Slatwall Wire Baskets, 12 x 12 x 4 or 24 x 12 x 4 inches. These Wire Baskets are wide enough to fit most products like plush toys, board games, mugs, and pens. Don’t forget to pick one of our color options: Black, White, or Chrome for these Slatwall Wire Baskets. Any order placed before 4pm PST will be shipped the same day if they are in stock, call to find out: 1-800-426-5708.